Bartholomew I met with Volodymyr Groysman. 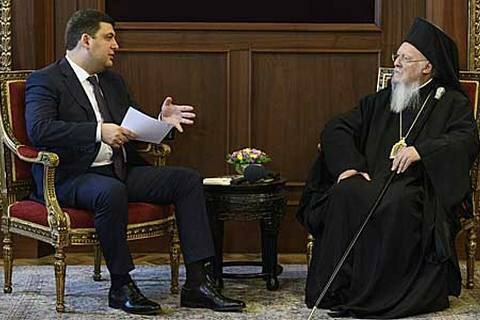 The Archbishop of Constantinople - New Rome and Ecumenical Patriarch Bartholomew I said that Ukraine will receive a unified Orthodox Church. "We pray that the Ukrainian people were united in the same church. The Mother Church of Constantinople will help you in obtaining such a unified church. We should be optimistic about the future," Bartholomew I said during a meeting with Prime Minister Volodymyr Groysman in Istanbul on 14 March. Last June, the Verkhovna Rada has appealed to the Ecumenical Patriarch Bartholomew I requesting to grant autocephaly to Ukrainian Orthodox Church. In particular, the Rada asked Bartholomew to issue a Tomos (decree) on the autocephaly of the Orthodox Church in Ukraine to allow it to take a proper place in the family of local Orthodox churches. However, the All-Orthodox Council on Crete on June 18-26, 2016 failed to adopt such a Tomos.